Canberra Women in Business is a not for profit incorporated association, supporting women in business in the Canberra region. Formed in 1992 as the Chamber of Women in Business, Canberra Women in Business is an organisation created by women and run solely for women, to provide support and networking opportunities for businesswomen in the Canberra region. Canberra Women in Business fosters the confidence to establish and grow successful businesses. Our goal is to help our members develop powerful connections in a welcoming environment tailored to women. 2018 is Your Year of Growth. Our events offer a light-hearted and interactive way to make new business connections. We aim to create a welcoming place where networking is fun. We also provide information on other events in the Canberra Region, which are relevant to business or opportunities for development. 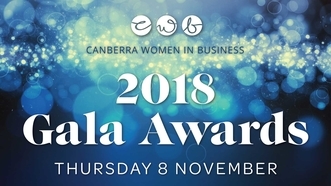 The CWB Annual Gala Awards Night recognizes and rewards the valuable contributions and outstanding achievements of the amazing women working in the ACT community.